Day 2 in Bohol started early for us. We were expected to be up and about way earlier but we were tired the previous day so we decided to sleep in a little longer. We had free breakfast at 7 am and proceeded to a 45-minute boat ride to Balicasag Island. We missed the dolphins and the boatman said it’s wavy anyway so they’re expected to stay away. Our tour package only included the fee for the boat ride to and from the resort and snorkeling privileges for two guests. Since we’re 5 people, and 2 begged off from snorkeling, we had to pay for one more person’s gear. We didn’t avail the flippers though because the spot wasn’t deep (as in waist-deep) and well, we’re cheap. Balicasag is a good spot to see marine creatures but in my opinion, Coron is better, because it’s more colorful underwater. But this was still a great spot, especially for first-timers. The corals were impressive. I am for all efforts to preserve them. Since it’s a very shallow part of the ocean, we had cuts and scrapes from the corals and our soles weren’t spared because we didn’t have flippers, remember? However, it’s worth all the bloody, mahapdi mess. After the morning activities, we asked for the food to be served. Before snorkeling, we reserved a kilo of fresh squid to be cooked three ways – adobo, calamares, and inihaw. They were served promptly with rice for P15 a cup. It was yummy. It’s rare to go wrong with fresh seafoods. Anyway, the vendors did not mention that they charge P250 as cooking fee, so you have to consider that when you mentally total your bill. After lunch, we looked for a sari-sari store because we’re thirsty. A few meters away from the shore, we saw a store and an elementary school. The price of the goods were a little steep but we understood – to get those merchandise, you have to ride a boat for 45 minutes then travel 45 minutes more to get to the city, and back! We left Balicasag a little after 12 noon. After 30 minutes, we were in Virgin Island. We stayed there for about 20 minutes only. We just took pictures. We’re back in Whites & Greens early enough to enjoy the waves of its beach. I liked it because it’s not full of seaweeds. It has lots of pointy rocks near the shore though. But overall, we had a grand time frolicking under the sun. After this, we took time to fix our things, talk, and freshen up for dinner – although, “taking a bath” in saltwater did not really make a difference. We had dinner in Kan-anan Restaurant in Dumaluan Beach Resort. We thought we’re hungry so we ordered coma-inducing food – kangkong with bagnet (more like bagnet with kangkong! ), shrimp slathered with crab fat, bangus ala pobre and grilled liempo. We decided to walk the shore after dinner for fear of killing ourselves from heart attack. The food was good and the price was reasonable. Ambience was very satisfactory, too. Today, we spent the following per pax – P130 (lunch in Balicasag, total is P650 including tip), P200 (share in extra snorkeling gear), P400 (Kan-anan gluttonish dinner). Plus less than a hundred, give or take, from the sari-sari store drinks and junk food purchase. There was a change in my travel plans this year. Because of Cebu Pacific’s zero fare promo, I decided to scrap my Tokyo trip in October and split the budget (which I still don’t have in full, as there are still paydays UNTIL October) for two trips. I felt bad giving up Tokyo as Rachel and I were all set since the year started. However, she understood, plus she has legitimate reason to go there anyway while I’d only be tagging along. Maybe in 2010. Tokyo’s not going anywhere. Why 2010? Later. So the first of my two trips was already booked, though still for November, in one of our long weekends in the office. 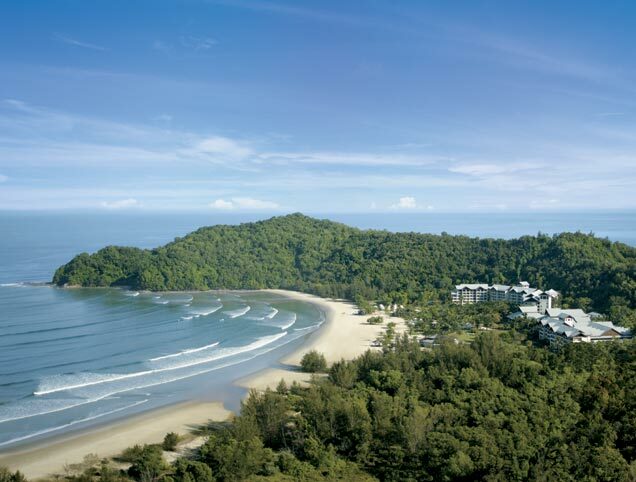 Rachel, Lalaine and I are going to Kota Kinabalu in Malaysia for some skinny dipping. Hahaha, joke. But we’re really going there! Since the airfare is quite a steal, we had more leeway, budget-wise, for our accomodations so we’re opting to stay at Shangri-La’s Rasa Ria resort right in the heart of Kota Kinabalu. I definitely have to make bawi because I had a beach drought this summer because of schedule constraints. At least Rach and Laine are going to Bora, although separately, next weekend! Ako sa Subic lang, uwian pa. Hay naku. The most immediate one after that would be Batanes that has a 99% chance of being scrapped unless we want to be stranded there for long, or worse, dead. Bagyo season na eh. The second trip is still in the works so I will not say anything about it yet although it also involves the beach. By May 2009, Raft3r and I are planning to go to New York, swinging by Vegas (where he has a cousin), and maybe San Francisco (where my sister is naman). I’m excited with New York. I don’t know if Boeing Boeing (wih Bradley Whitford) will still be on Broadway by then though I’m fervently wishing it would still be, or kahit repeats na lang; that’s one of the best things I’m looking forward to there. I’m planning to use my miles for this US trip para di masyado mahal. And I also have to renew my visa. Sana wag ako ma-deny, hahaha! I gave up on planning trips by myself because they always don’t push through. I guess it’s reality’s way of telling me that travels are best done with a friend. After all, who would take your pictures – good ones, hindi yung puro mukha mo lang ang kita kasi sariling sikap – if you’re alone?